We shared a bold ambition for Uber Eats to own one of the biggest sporting moments in Australia - The Australian Open. 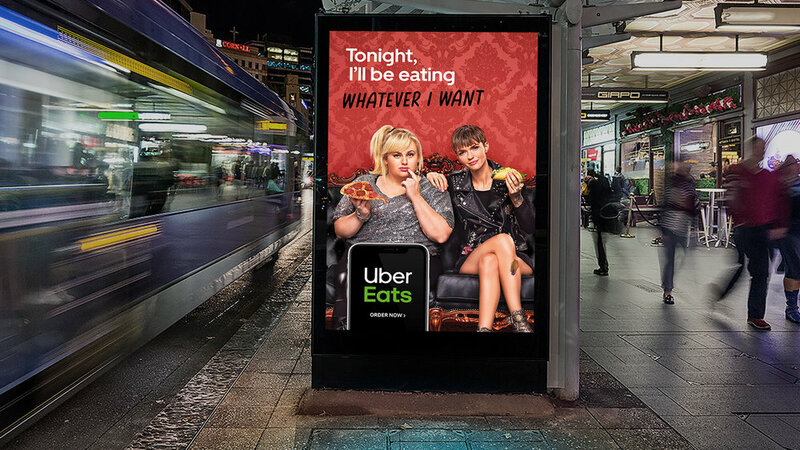 We asked ourselves, how could we leverage the now famous ‘Tonight I’ll be eating…’ brand platform to own this cultural moment in a way that was distinctly Uber Eats? The answer, was to do the opposite of every sponsor. We broke the rules of standing out - by blending in. After each ad break, when people believed they were returning to the match, they were instead seamlessly presented with an Uber Eats dinner order delivered in a way that was identical to the tennis. The industry termed this campaign a “Game Changer” for sponsorship integration. Since launching in September 2017, the Uber Eats ‘Tonight, I’ll be eating…’ platform has been phenomenally successful in establishing Uber Eats as the category leader. So, in 2018 we refreshed the campaign to highlight the variety of options available on Uber Eats and support a growing list of partner restaurants. We created an entertaining and engaging campaign using celebrity duo’s including Rebel Wilson & Ruby Rose, Ray Martin & Lee Lin Chin plus Hamish Blake, Andy Lee & Lleyton Hewitt.